Description: Three Different types of Amtrak Locomotives! At LaVergne. Description: AMTK slides to a brief stop at Lincoln Station's boarding platform on it's way to Omaha, Nebraska. Description: AMTK 809 and 832 on the BN mainline headed for Lincoln Station in Nebraska. 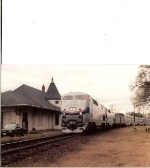 Title: Southbound "City of New Orleans"
Description: Amtrak 832 is ready to couple up to the northbound Auto-Train. Description: Amtrak's Westbound Sunset limited! Description: Inside the locomotive body of refurbished Amtrak P40DC No. 832 on display at Union Station. Description: Refurbished Amtrak P40DC No. 832 on display at Union Station. Description: AMTK 832, a freshly rebuilt P40DC, in the consist of train 29. Description: Right on time,I think.. Description: Amtrak P40DC 832 sits at Louisville Union Station. Description: With the old grade crossing completely removed, a P40 leads the Illinois Zephyr west through Belmont. Description: A overpowered Illinois Zephyr heads east through Belmont. Description: IC RR Gilman coal chute. Description: A double set of refurbished P40DCs lead the SB City of New Orleans through Ponchatoula, LA behind the Elmer's Candy factory. Description: A double set of refurbished P40DCs lead the SB City of New Orleans through Ponchatoula, LA. Description: The final days of searchlight signal operations in Naperville are here, a P40 leads the Illinois Zephyr under the new and old signals. Note the private car that is the first car here.